It is the MCAC policy that it’s operation be manged to protect the health and safety of our company owner operators and the communities we do business in. Sound operating practices will be followed to foster a safe working environment. At Motor Car Auto Carriers, Inc. we are driving for safety. The success of any safety program depends on the cooperation and active support of ALL. The company, therefore, expects company owner operators to follow safe work practices in the interest of their own safety. As a proud member of the FMCSA Licensing and Insurance System, Motor Car Auto Carriers can say with confidence that we have your best interests at heart. Being a member of the FMCSA system gives us the benefit and advantage of having a tremendous amount of data, a knowledge that we then pass on to you. 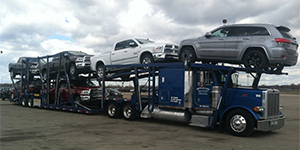 We do so by applying this knowledge and information into our practices as an auto transport company so as to maintain the high level of standards the federal government has developed for this industry. Additionally we can then use the data and the continually updated information into making sure we have the most up-to-date statistics, news and alerts from the FMCSA. Being part of the FMCSA’s Licensing and Insurance System means being part of a system of checks and balances that ensures we are as committed to getting your vehicle to where it needs to be as we are of adhering to the rules and regulations of the FMCSA. As part of a regular routine they perform safety audits that review our carrier’s management system which includes a variety of things such as vehicle maintenance, accident register and driver qualifications. The audits are done on-site and are in place ultimately to protect everyone involved including the carrier company, law enforcement that patrol the highways as well as commuters who have to share the road. That’s what the FMCSA believes and they have the facts to prove it. Motor Car Auto Carriers believes in safety and believes in good business. So when you trust your vehicle shipping to us, know that we will continue to do everything we can get your vehicles where they need to be the safest way possible. We pride ourselves on the reputation of having not just great service and affordable rates, but a safety record that is hard to beat. We wouldn’t be the company we are today without that kind of commitment. That’s the same kind of commitment we give to each and every one of our customers.